The fort was constructed in 1613 to guard against the Dutch and the Marathas. It was a reference point for the vessels coming from Europe at that time. 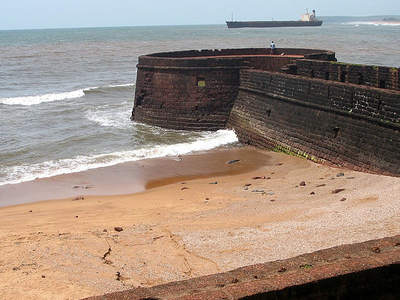 This old Portuguese fort stands on the beach south of Candolim, at the shore of the Mandovi River. It was initially tasked with defense of shipping and the nearby Bardez sub district. A freshwater spring within the fort provided water supply to the ships that used to stop by. This is how the fort got its name: Aguada, meaning Water. Crews of passing ships would often visit to replenish their fresh water stores. 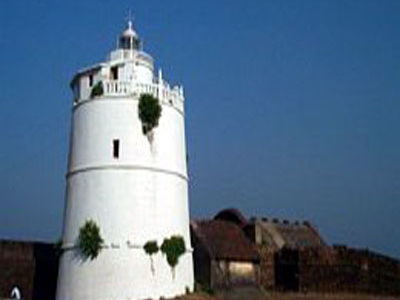 On the fort stands a four-storey Portuguese lighthouse, erected in 1864 and the oldest of its kind in Asia. Built in 1612, it was once the grandstand of 79 cannons. It has the capacity of storing 2,376,000 gallons of water, one of the biggest freshwater storages of the time in whole of Asia. This fort is divided in two segments: the upper part acted as fort and watering station, while the lower part served as a safe berth for Portuguese ships. Whereas the upper part has a moat, underground water storage chamber, gunpowder room, light house and bastions, it also has a secret escape passage to use during time of war and emergency. The lighthouse at initial stage is used to emit light once in 7 minutes. In 1834 it was changed to emit light creating eclipse every 30 seconds, however it was abandoned in 1976. The five-star-rated hotel, owned by the Tatas, is part of an 88-acre (360,000 mi sq) complex overlooking the Arabian Sea is situated on Sinquerim Beach. Here's the our members favorite photos of "Forts in Goa". Upload your photo of Aguada Fort! Connect with Raj Francis, Shelton D'mello and 10 other members who have already visited Aguada Fort.